Discussion in 'Coop & Run - Design, Construction, & Maintenance' started by Q9, Aug 6, 2009. We finally got our chickens yesterday, and today found out that hardware cloth doesn't deserve its reputation. We brought home four Rhode Island Red chicks, and our dog immediately went nuts, as we predicted. For most of the afternoon until it started raining, Hannah (the dog) was chained up or one of us was standing guard by the coop. Sometime this morning, the chickens were apparently out in the run and our dog saw them and her prey drive kicked in. From what I can tell, she found a weak spot in the wiring and broke in, then killed every single chicken we had. In other words, the day after we bought our chickens, our half-idiot dog managed to tear through the very thing that everyone on here was saying to use instead of the "traditional" chickenwire, and kill all four of our chicks. I've seen and felt the traditional metal chickenwire (AFTER installing hardware cloth), and I can tell you now, the kinds I felt were far stronger than hardware cloth. Sorry for your loss. They do make different grades (gauges) of hardware cloth. Some I have seen would be easy to penetrate while others would not. I'm facing a similar situation... I have dogs that can and will get into my duck pen but I keep them in a different part of the yard. I am considering putting chain link or cage wire on top of my poutlry netting to keep the larger animals from penetrating it. Hopefully the double fencing will keep everything out. Did the dog get through the fastenings, or tear the hardware cloth apart? If it was well installed, welded hardware cloth I do not see how an animal got through it. Was the installaltion strong enough? How was it fastened to the posts? What kind of material was your hardware cloth. Well you know your Dog better than anyone. What do you think will prevent him from getting into the coop run? Chain link Fencing with smaller wiring like chicken wire inside. Is what I would suggest. Baby chicks can fit through Chain link. Is their any chance you could train him not to attack the birds? It will take time, But be well worth it. Quote:I am really sorry to hear your bad news. I too would be interested to hear about your installation was so that we can all learn from this sad situation. I have only 1/2 hardware wire (and the top half is chicken wire - it's very flimsy) on the walls of my run and there is no way my dog could get through it. She's a laborador and quite strong. Everyone must build their pen and coop to protect their chickens from the predators in their area. It sounds like your area's predator (your dog) is very strong. You may have to A.) build a double wall pen with chain link to keep the dog out, and hardware cloth on the bottom to keep the chicks in. B.) Keep your dog in a chain link run or on a chain at all times. Either way, it sounds like you'll have to build fort knox in your yard. Keep in mind many dogs dig under fences, so you will have to bury an "apron" around the bottom of your fence. Hope you find a solution that will work with your family! There is always electric fencing, or a shock collar. I had a very simlar thing happen to me. A few years back I bought 8 full grown hens and brought them home one evening. The next morning they were all slaughtered by the neighbors dog. I had a temp board over the old run door that was not secure. I was so upset... not only did I spend all that money for nothing but I also never got the first egg from them Poor chickies... but I learned my lesson. My new run is made from some old chain link fence with landscaping timbers. No dog is going through this!! 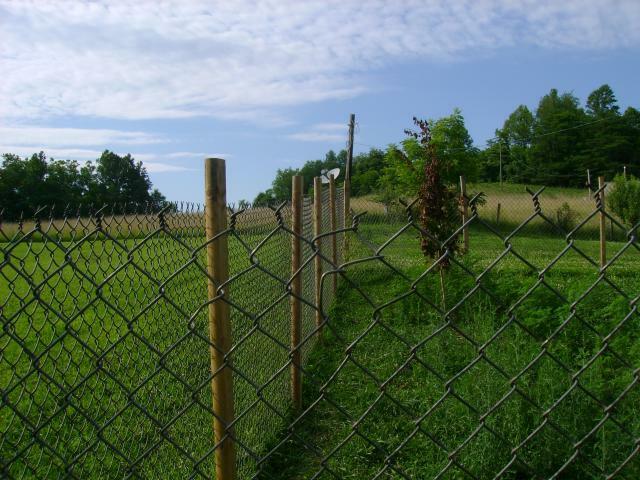 Don't overlook dog chain link fence enclosures. If it can keep a dog in, it can keep a dog out. Please include buried hardware cloth along the bottom to keep out other predators and keep in little fuzzybutts!